In terms of web design, Don't Make Me Think by Steve Krug — so important for anyone learning how to build websites. 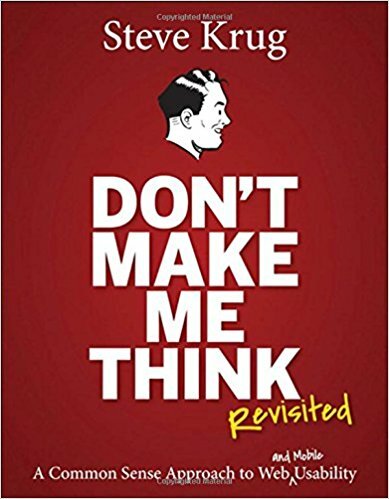 I work in digital marketing so I would [recommend]: [...] Don't Make Me Think by Steve Krug. I’m actually a self-taught programmer, so these books have really helped me with practical skills that I could put to use & yield results. The return on investment for these kinds of books is off the charts for me! Krug was teaching usability two decades ago when UX wasn't a buzzword, and the WWW was still in its nascent stages. (The first edition of this book was published in 2000!) I cut my teeth on Don't make me think back when I first started out in the industry. It is now in its third edition and still relevant — it offers compelling insights into building great user experiences into websites and applications. I’m a technical guy. I studied the IT field and did software development for a long time until I discovered the business world. So the path for me is to slowly adapt from the clear, technical world, to the fuzzy, way more complex, business world. All the books that I recommend help this transition. “Don’t Make Me Think” - Steve Krug: for seeing software with the eyes of the user. Witty, commonsensical, and eminently practical, it’s one of the best-loved and most recommended books on the subject. Now Steve returns with fresh perspective to reexamine the principles that made Don’t Make Me Think a classic–with updated examples and a new chapter on mobile usability. And it’s still short, profusely illustrated…and best of all–fun to read. If you’ve read it before, you’ll rediscover what made Don’t Make Me Think so essential to Web designers and developers around the world. If you’ve never read it, you’ll see why so many people have said it should be required reading for anyone working on Web sites.